HAVE A COZY CHRISTMAS COUNTDOWN! Join Killer Characters at the Have a Cozy Christmas Countdown! In celebration of the holidays, KillerCharacters.com is giving away a book a day. From November 26 to December 25, visit their site and leave a comment, and you’ll be entered for that day’s giveaway. Return the next day to see if you won. You have thirty chances to win! Be sure to come back each day and leave a new comment to enter the drawing for that day. Good luck. From all the Killer Characters and their authors, Have a very Cozy Christmas! Head over there every day to enter the giveaways!! 2013 WHERE Are You Reading Challenge Sign Up!!! Sheila at Book Journey is hosting this challenge for the 3rd year. What is the point of this challenge? between January 1 2013 – December 31, 2013. Today I am just 1 book away from completing the challenge for 2012. It was much easier than I thought it would be. I only had to search out books for a few states. plus I visited 18 places outside the U.S. too! This is also the third year for this challenge. NOTE: If you don’t have a blog and want to participate, that’s fine. You don’t have to have a blog, just post in the comments section as you finish books. If you belong to a site like Goodreads and review the books there, that’s fine too. Just leave us the link. 6. Take the button above, put it on your blog and post about the challenge. Then add your name to Mr. Linky at Yvonne’s blog. Please use the link of your challenge post, not the link to your home page. 7. She’s going to have one link for signing up, one link for completed reviews and one link for your wrap up posts. I am signing up at the Super Sleuth level of 13 or more books!!! CLICK HERE to join this challenge! Yvonne at Socrates Book Review Blog is hosting this one too! 2) It doesn’t matter if you have 1 or 10 books in a series to complete it, it qualifies (i.e. if you only need to read one more Sookie Stackhouse book to complete the goal, that’s fine) The goal is to complete a series from wherever you are up to until the last published book. 5) If you don’t have a blog, that’s fine. Just leave a comment to sign up and tell us what you are reading. 6) Any format of book counts – audio, ebook, etc. 7) You should choose the series you want to finish before the challenge begins, but it isn’t necessary. It’s fine to change series during the year – as long as you complete whichever series it is. Level 1 – Complete 1 series. Level 2 – Complete 2 series. Level 3 – Complete 3 or more series. I have several series I want to catch up on so I am signing up for Level 3. Right now the ones I hope to catch up are Janet Evanovich Plum Series, J.B. Stanley’s Supper Club Series and one other series after I tidy up my To-Be-Read stacks. What An Animal Reading Challenge VI will begin on January 1st. d. a main character is (or turns into) an animal (define that however you’d like). 3. Challenge runs from January 1, 2013 to December 31, 2013. That’s a full year to read at least 6 books (you can read more if you’d like). 8. You don’t have to have a blog or write a review, but you can if you want to. If you don’t have a blog, just post in the comment section that you’d like to join. You can post your books in there. CLICK HERE to head over to Yvonne’s blog to sign up!! I sure am! I am signing up to read 5 books! If you like Reading Challenges as much as I do, you have to subscribe or follow this blog! There is a team of bloggers at work there to keep us up to date on all the latest challenges. I will post the ones here that I am participating in but there will be tons of challenges out there for 2013 and some start at different times of the year. I subscribe to the blog via email so news of new challenges land right in my Inbox. 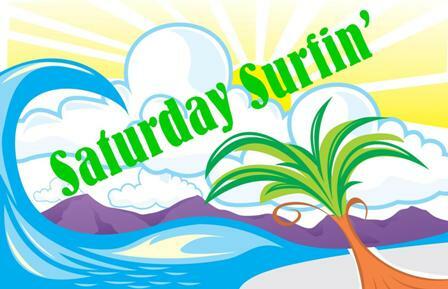 That’s it for week 10 of Saturday Surfin’. If you see some posts you feel should be shared please leave the links in the comments section for people to visit. The weeks are too short to travel to all the wonderful blogs in the blogosphere but together we can help find and direct each other to at least a few. Whew, suddenly this weekend I’m seeing 2013 challenges everywhere! Sounds like you’ve picked some good ones. 🙂 I’ve been mentally planning…now I need to actually pick things out and sign up. I do know I’m joining the Finishing the Series challenge, though! OOH I have some challenges to check out later tonight… so much fun! Thanks for joining my challenges! Have fun!